Geneva (AFP) - There was an outpouring of condolences from leaders around the world on Saturday after the death of former UN Secretary General and Nobel Peace Prize laureate Kofi Annan. Current UN chief Antonio Guterres described Annan as "a guiding force for good". "In many ways, Kofi Annan was the United Nations. Annan's successor Ban Ki-moon said he "will always be remembered and respected for his vision and courage to keep the principle and idea of the United Nations". The UN high commissioner for human rights Zeid Ra'ad Al Hussein described him as a "friend to thousands and a leader of millions". "Kofi was humanity's best example, the epitome of human decency and grace. In a world now filled with leaders who are anything but that, our loss, the world's loss becomes even more painful." President Nana Akufo-Addo declared a week of mourning for "one of our greatest compatriots". "He brought considerable renown to our country by this position and through his conduct and comportment in the global arena. "Kofi Annan devoted his life to making the world a more peaceful place through his compassion and dedication to service," the US ambassador to the UN, Nikki Haley, said on Twitter. "He worked tirelessly to unite us and never stopped fighting for the dignity of every person." Former president Barack Obama said Annan "embodied the mission of the United Nations like few others". "His integrity, persistence, optimism, and sense of our common humanity always informed his outreach to the community of nations. Long after he had broken barriers, Kofi never stopped his pursuit of a better world, and made time to motivate and inspire the next generation of leaders." European Commission chief Jean-Claude Juncker said the "greatest recognition we can give Kofi Annan is to keep his legacy and his spirit alive". "He devoted his life to making the world a more peaceful and united place. He fought to end suffering and injustices across the world and helped to rebuild bridges where they had been destroyed." "I sincerely admired his wisdom and courage, his ability to make informed decisions even in the most complex, critical situations. His memory will live forever in the hearts of Russians," said President Vladimir Putin. NATO chief Jens Stoltenberg said "the UN and the world have lost one of their giants". "His warmth should never be mistaken for weakness. 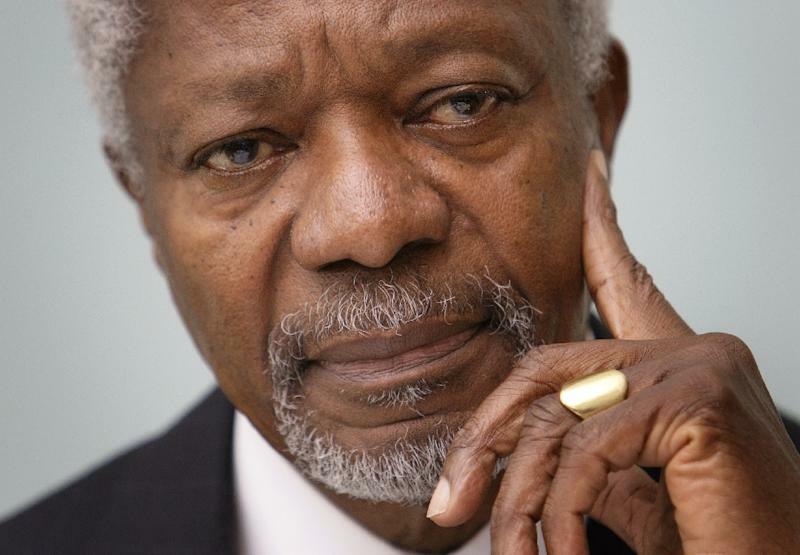 Annan showed that one can be a great humanitarian and a strong leader at the same time." "A great leader and reformer of the UN, he made a huge contribution to making the world he has left a better place than the one he was born into," British Prime Minister Theresa May said on Twitter. Former prime minister Tony Blair said his "good friend" was a "great diplomat, a true statesman and a wonderful colleague who was widely respected and will be greatly missed". Both key figures in the deadly turmoil that followed Kenya's 2008 election paid tribute to Annan, who helped mediate an end to the violence. Former president Mwai Kibaki said Annan "will be remembered for mediating for the return of peace in Kenya". Opposition leader Raila Odinga hailed "what became known as 'the Annan Doctrine' in which he made it clear that the need to respect sovereignty cannot be used as a shield by governments to brutalise their own citizens and that the international community has a right to intervene". President Cyril Ramaphosa praised Annan as a "great leader and diplomat extraordinaire" who had advanced the African agenda within the UN and had "flown the flag for peace" around the world. Retired South African archbishop Desmond Tutu described Annan as "an outstanding human being who represented our continent and the world with enormous graciousness, integrity and distinction". "A rare breed of diplomat; soft spoken but unshakeably firm," tweeted Nelson Chamisa, the main opposition leader in Zimbabwe -- where Annan visited days before the July election. "He had great love for world peace & democracy. A believer in Zimbabwe & its people. Go well son of Africa, Champion of the world!" Chancellor Angela Merkel hailed the "exceptional statesman in the service of the global community". Annan "inspired me and many others with his ideas, his firm convictions and his charisma". "We will never forget his calm and resolute approach, nor the strength of his fighting spirit," President Emmanuel Macron tweeted. The Elders -- a group of statesmen co-founded by Annan which speaks out on global issues -- hailed him as "a voice of great authority and wisdom in public and private". "The world has lost an inspiring figure –- but one whose achievements will never be forgotten, and whose commitment to peace and justice will endure to inspire future generations," deputy chair Gro Harlem Brundtland said in a statement.